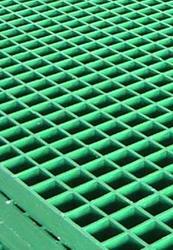 We offer a comprehensive range of Industrial Grating that is manufactured using premium raw materials such as M.S. Flat Bar & Square Bar and advanced technology. The range is reckoned for efficient performance, tensile strength and lasting service capability. Cost effective and timely delivered, our range is in our clients’ priority list. GRP Grating is being offered to the customers from us. These are widely preferred due to their superior functionality and come with suitable surface protectors.